Last week Australia's Budget painted a picture of calm, steady success. 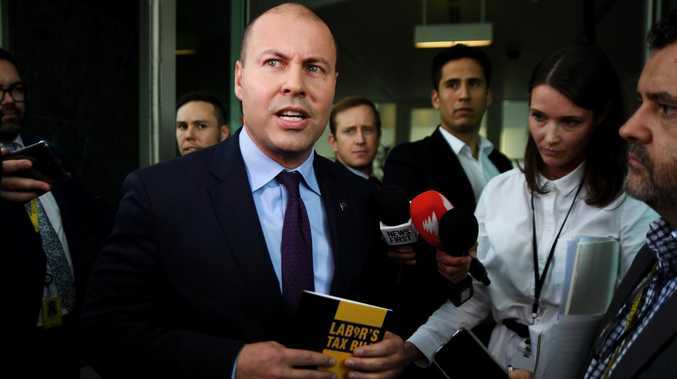 "The Budget is back in the black and Australia is back on track," said Treasurer Josh Frydenberg on Tuesday night. He promised both immediate tax cuts and years of budget surpluses. Anyone who just tuned in might assume Australia's financial future is assured. But there's a fair bit going on the government would rather you didn't notice. Glance at the forecasts in the Budget and you'll see numbers that are worse than last year. Forecasts for wages, in particular keep falling. In last year's budget the government expected 3.25 per cent growth in the wage price index in 2019-20. That number didn't last. By the mid-year budget update the forecast fell to 3 per cent. And now, just a few months later? The Budget has whittled it down again to a cool 2.75 per cent. That means wage growth next year just 0.5 percentage points above forecast inflation. The Treasurer said it in his Budget speech: "[E]very one of us wants to see wages growing faster." And he's right. We all want it. But that was it. That was the last word in the speech about wages growth from the man charged with managing our economy. Wages growth is vital for making sure the Australian economy remains healthy. We need people to earn money so they spend it at shops and cafes and hair salons - all the things that we call household consumption. Household consumption makes up over half of the Australian economy and we won't do so much consuming if we start getting nervous about our next payrise. It is no exaggeration to say low wages growth is a risk to economic growth. What could really tip households out of spending mode and into saving mode is a fall in house prices. That was another topic we didn't hear much about on Budget night. As 2019 progresses, house prices are still falling on average nationwide. In the two biggest cities price falls are largest. Prices are down 0.8 per cent in the last month in Melbourne, and 0.9 per cent in Sydney, according to CoreLogic data. There are many other risks to the economy too - we still depend mightily on commodity prices, for example, and they could fall. Iron ore in particular is at a record high price of US$92 a tonne right now, thanks to a mining disaster that has cut supply and pushed up prices. So the Budget sounds as if it is in great condition - but only if you ask if it is balanced. It is. Revenues are greater than expenditures. There is, however, more to an economy than that. After all, Australia got itself back to surplus even without strong economic growth. How exactly did we do that? The answer is partly inflation. As you know, prices rise every year, and so do wages (even though wages have not risen much faster than inflation recently!) While prices and wages keep rising, tax thresholds stay stationary and more people pay more tax. That means that the government collects more revenue every year. If a government doesn't adjust tax thresholds, it can usually get back towards surplus just by waiting for people to move into the next tax threshold and pay higher rates of tax. We should appreciate tax cuts, but we shouldn't always believe they're the result of extraordinary economic management. One - it's our own money coming back to us, and two - they're often just compensating for inflation. If governments don't move those tax brackets they can start to seem very low. 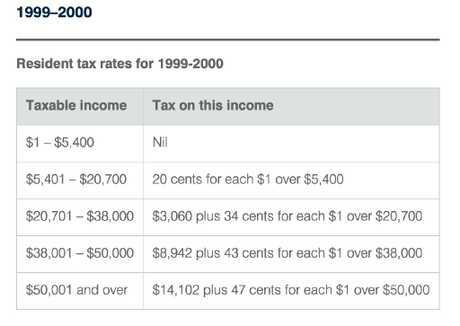 To see what I mean, check out Australia's tax thresholds from 1999-2000, in the left column of the next table. The top tax threshold was just $50,000! Our current top tax rate is 45% on income over $180,000. Just 19 years ago the top tax rate was similar - 47%, but the threshold was much, much lower. All this time, you see, governments have been moving the thresholds higher to account for inflation and calling it tax cuts. This is an election Budget, so it includes cash handouts for energy payments as well as nice tax cuts for middle income earners. Both major parties have now pledged to deliver those tax cuts. Sometimes an election budget is unaffordable and unwise - all those handouts! But not this time. This year not only can the budget afford to give out tax cuts, but the economy needs them. The risks we've described above - all the doubts over wages and household consumption - will be helped by putting more money in people's pockets. This is good luck rather than good management, but a big high-spending election campaign would probably be very helpful for the economy right now.